In funky blue color with hypnotizing patterns embossed, this Blue Mixing Bowl has a capacity of 2.15 quarts and measures 9.5 inches in diameter and 4.5 inches high. 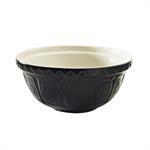 The 4.25 Quart traditional cane mixing bowl is our best selling size. Great for cake batter, cookie dough, and other baking mixes. 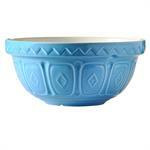 This size ceramic bowl also works for soups, puddings, ice cream, and snacks. 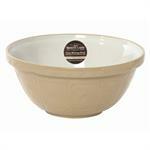 The Mason Cash S6 (33cm) mixing bowl is perfect for large batches of cookies, pastries and loaves. 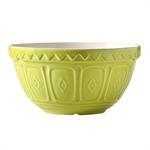 The shallow shape of the mixing bowl is perfect for kneading dough and the patterned exterior helps cooks grip the bowl. The inside glaze is classic white, while the outside sports a historic relief design under an elegant sandy glaze. Three evenly spaced notches in a prominent outer lip make it easy to hold onto while mixing. Chip-resistant inner finish. For mixing smaller batches of dough or batter. Also great for counter top display of fruits and vegetables. Classic ceramic cane. 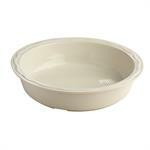 Easy to clean, microwave Safe and dishwasher safe; measures 8.25-Inch Diameter, 4-Inch Height. Cheerful, bright apple green color! 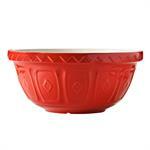 In funky red color with hypnotizing patterns embossed, this Red Mixing Bowl has a capacity of 4.25 quarts and measures 11.5 inches in diameter and 5.5 inches high. The Perfect Pie Round Pie Dish is made of quality stoneware which conducts heat slowly and evenly, spreading the heat throughout. It has a 2.15-quart capacity and measures 11 inches in diameter and 2.5 inches high. 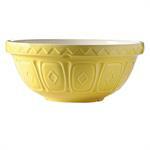 In funky yellow color with hypnotizing patterns embossed, this Yellow Mixing Bowl has a capacity of 2.85 quarts and measures 10.25 inches in diameter and 4.75 inches high.